Sorry readers, I have neglected you for far too long. Truth is, this crazy, busy, plate spinning life of mine has gone into warp drive and this combined with some lovely seasonal lurgies knocking us all down like dominos has left very little time to do any writing. I'm just back from a half term break with Jules, thanks to respite support from The Children's Trust at Tadworth and my mum stepping in to hold the fort in my absence. I really needed these few days away from what has become our normality to regroup and recharge, things happened so quickly over the past few months and it has been difficult just to catch my breath with the speed of events. I went back to Normandy, so strange to think that last August Andy and I managed to work the logistics to take a break here without children, it was a lovely few days together, oblivious to the bomb that was about to go off in the middle of our lives. It is amazing though how quickly it has all become our new norm; chemo, injections, juggling respite, adapting to a new raft of medical terms. 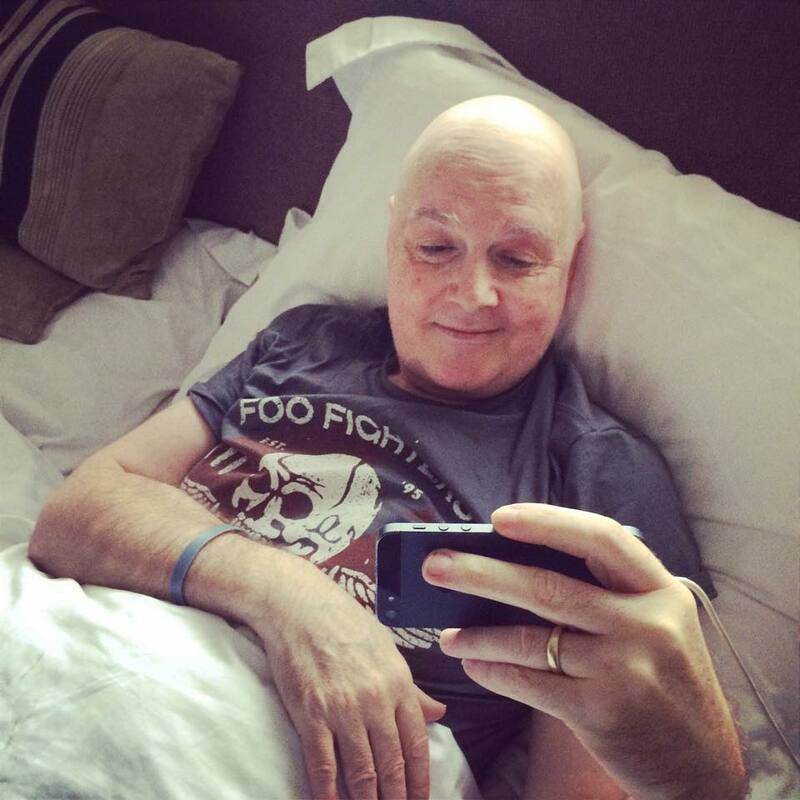 After 5 gruelling rounds of chemo, Andy had scans which showed that the drugs are working, the primary tumour in his bowel and the secondaries in his liver have shrunk by 30%. In fact the treatment is working so well that the liver surgeons have asked for 2 more rounds in addition to the initial 6 planned to optimise tumour shrinkage. The plan is then for more scans, followed by a week of intensive radiotherapy treatment on the primary tumour and while that is cooking (the oncologist's term), resection of Andy's 3 liver metastases, followed, once he has recovered by removal of the primary tumour. So far so good. We knew at the start of treatment that the first three months were crucial. 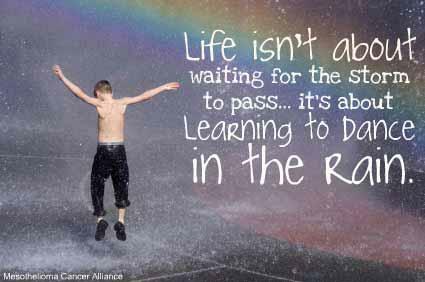 The chemo is working, the side effects are manageable and in between chemo fog, when Andy has a few days of feeling OK, we have a life. We see friends, we get out of the house and we have lots to eat. Surprisingly life is good, there is a focus, there is a new appreciation of the little things - even more than before, and despite cancer life does go on. We have a lot to look forward to, getting back to Glastonbury Music Festival at the end of June is the focus for Andy at the moment and we will be doing everything in our power to make sure he gets there.. I needed a break away also to put things into perspective. Andy and I have been living in each other's pockets for the last few months. We are very close, you can't go through everything we have been through in the 26 years of our relationship and not be very close but we are also used to having our own lives. Andy has not been able to work since he became symptomatic at the end of September, so not only did cancer come to call but it took away our financial security, Andy's interaction with the outside world and forced us to live in eachother's pockets 24/7. All the frustrations and anger and emotions boil over when you are confined to close quarters so time apart has made us appreciate the other all the more. And as I said, life still goes on. Over the past few weeks, as well as each member of the family dropping like flies with a nasty virus I have also been managing all of Daisy's medical care when she is not in respite, appointments still need to happen, conversations with professionals, decisions made. Thank goodness she is relatively stable at the moment and (touch wood) we seem to have a drug regimen which has helped reduce the seizures. I am worried about how quickly she tires and how her tiredness can often manifest in hitting out and aggression and I am worried about how we have gone from a child who could walk to one who is now 100% wheelchair dependent. There is no orthopaedic reason for this which is the normal reason that children with costello syndrome end up needing a wheelchair. Daisy's orthopaedic surgeon and neurologist agree that her issues are neurological but no-one can tell us why her picture is degenerative when this is not the case with the syndrome. I won't give up trying to find out, not because I think it will change things but I owe it to Daisy to understand as much as possible about what is going on with her to make sure her care and treatment is as supportive as possible. 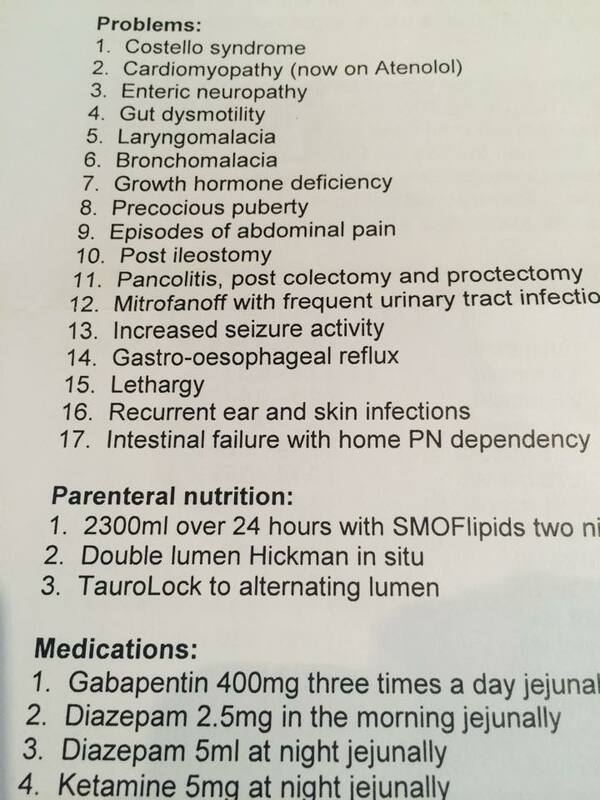 When we attend clinics at Great Ormond Street the follow up letter lists some of Daisy's issues, this is a copy of a recent letter, inevitably they have missed out one or two but it sums up Daisy's complexities. And then there are the other children. Xanthe has GCSE's coming up in a few weeks, this is a stressful time, without the added stress of a parent probably having major surgery just around the time of her exams and the unpredictability of her sister's health. I am also embroiled in the long and arduous battle to secure an Education and Healthcare plan for Jules (the new replacement to the Statement of Special Educational Needs). I don't use the word "battle" lightly. The new legislation for supporting children with SEN stresses putting the child and family's needs at the centre but I have not yet found this to be the case, although I still live in hope that things will change and get better. Fortunately our local authority decided not to contest the tribunal proceedings that we had to start late last year when they refused to assess Jules for a statement (although they did push this to the very last minute causing even more pre-Christmas stress than I would have liked). The whole sorry saga of trying to get Jules the support he needs to be able to succeed and shine as we know he can is worthy of its own blog post. Needless to say we are at the point where Jules is receiving home tuition, and enjoying every minute of having teaching tailored to his own learning style, I do wonder if we would have got to this point of him not even being in school, cancer or not, if intervention and funding had been put in place a lot sooner by our local authority. I will write a post about this, but once we have achieved what we need to achieve for Jules. 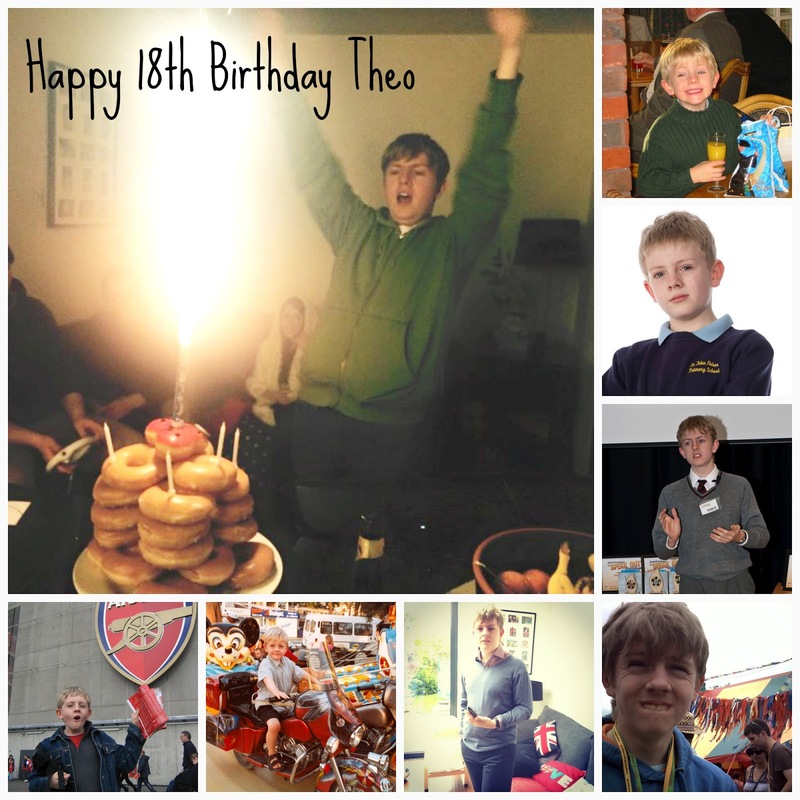 One of the big events, between chemo rounds was Theo's 18th birthday. Such a huge milestone. I can't believe how far he has come and how much he has been through in his 18 years. This time last year, Daisy was in Great Ormond Street for an inpatient stay when Theo appeared in her room announcing he had left school as he hated being in 6th Form. I despaired, wondering what would happen to my boy. How would he get on in life, would he ever leave home?!? Fast forward to his 18th Birthday and he is working as an IT Apprentice in a local college and studying for a Btec one day a week. He is earning great money, is on a pension scheme and loves his job (and they seem to like him). He was even asked to support the American Ambassador when he came to the college to give a talk, setting up his audio visual equipment, trouble shooting problems and having afternoon tea with him after his speech. So life goes on, it has to. We have a complicated family situation and our children still need us as much as ever, cancer or not. Birthdays have to be celebrated, exams studied for , battles fought, meetings and appointments attended. We have made plans for the summer, we have booked a holiday, we have even booked a short family break to Thomasland in the summer to indulge Daisy in her love of Thomas the Tank Engine. There is no getting away from it, life is hard, it's physically draining, it's emotionally taxing, but we're focused on the goal, getting Andy through the treatment and the cancer under control. There is no time to overthink the situation, frankly there is too much to day every day to sit and ponder on the cards that we have been dealt. But even though the hand isn't great we're playing them to the best of our ability. Steph, there are very few blogs I read every word of and yours is one of them. I am astounded that you managed to even write a post with the amount going on in your life. I won't ask how you cope because I know that, whatever is thrown at you, there is no choice but to carry on. I will send my admiration for your strength and tenacity (though I also know that this won't be how you feel lots of the time) and my best wishes to you all and esp to Xanthe for her GCSEs - we have the same here with Giorgio with the added shadow of EDS interfering with school attendance. Let me know privately if there's anything else you need re Jules's EHCP. Much love. I am truly humbled by your post and your tenacity. I wish you all the very best for the future and with all my heart hope that all the hurdles you currently face will leave you soon.